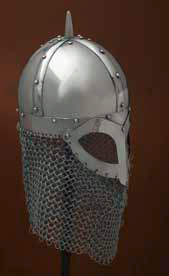 This rounded cap helmet has a small 2 cm spike on top,a spectacle guard around the eyes and nose, and a chain mail aventail. The eyeguard in particular suggests a close affinity with the earlier Vendel period helmets. Only one example of this helmet, excavated from Gjermundbu, Norway and dated to the 10th century, is known to exist. That Viking helmet was made of iron and was in the shape of a rounded or peaked cap made from four plates after the spangenhelm pattern. This page was last modified on 1 November 2013, at 01:27.